Last year, I purchased what I thought was a framed black and white print,copyright 1900 by the Tonnesen Sisters. I was especially interested in it because it had an intriguing handwritten note attached to the backing. The note said, “One of Mrs Jennings pictures of Sch’dy. Edna Lein’s (Lewis?) mother. Erie Pa.” Since I have had some success locating Beatrice Tonnesen’s original photos through the descendants of her models, I was interested in the possible clues offered in the note. The child model in the photo appears to be Alice Gudgeon (b. 1894), who was featured in a pictorial in the Chicago Tribune in 1900. So I scoured Ancestry.com and other sources for someone named Mrs. Jennings, Edna Lein or Edna Lewis, or any reference to Erie, PA in Alice’s life. But, alas, I found nothing. I also have no idea what “Sch’dy” might mean. Site visitor Ron Grassmann took one look at the little girl in our post of December 3, and was immediately reminded of a child in a print on a calendar in his own collection. Grassmann, who with his wife, Cora, edits Fox Tales, the newsletter of the vintage art collectors of the RA Fox Society, located the calendar and,very kindly, sent a scan to us for inclusion here on our blog. The print, titled “Chums” on the 1926 calendar, is signed Beatrice Tonnesen and was copyrighted by the Calumet Baking Powder Co. The name “Tonneson” appears on the mat below the print, evidently added, but not proof-read, by the publisher. Thanks to Ron Grassmann for sharing this charming find with us! It’s always a thrill to find a signed Tonnesen image that I have never before seen! But this one is especially interesting, featuring elements that further connect Tonnesen’s work with that of her colleague R. Atkinson Fox (1870 – 1935), as well as providing a closeup view of a vintage baby doll that allowed me to confirm another print in my collection as a Tonnesen. Both prints, seen here in the accompanying slideshow, are examples of the work Tonnesen did in the last decade of her career, and they feature two beautiful child models who seem to have been among her favorites. 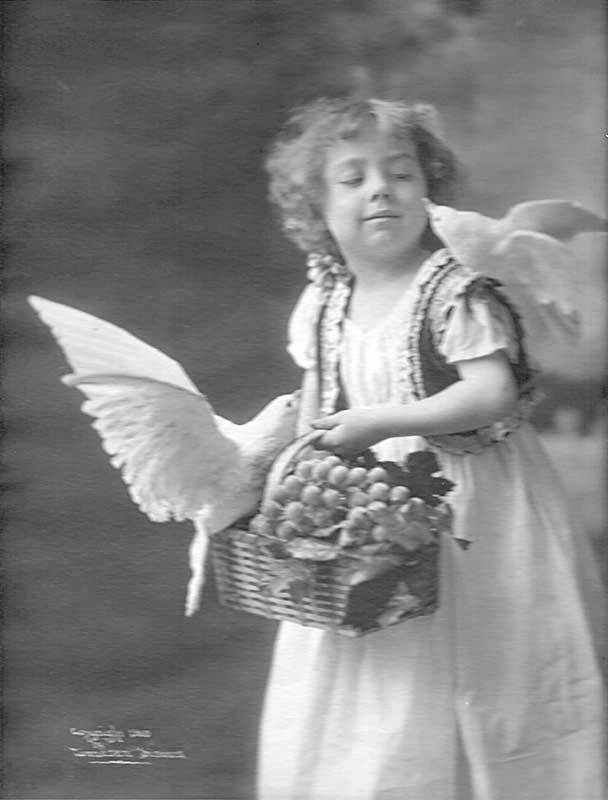 I have seen the child in the signed print in photos by Tonnesen that appeared as prints with copyrights dated 1921 to 1927. Always pensive, never smiling, I believe she also appears in at least one image painted by R. Atkinson Fox under his DeForest pseudonym. Fox collectors can see her in DeForest’s “He Loves Me, He Loves Me Not,” [included in the Beatrice Tonnesen Catalog Album 8] in which she appears alongside a young admirer posed by fellow Tonnesen model William Redmond (1908-1992). 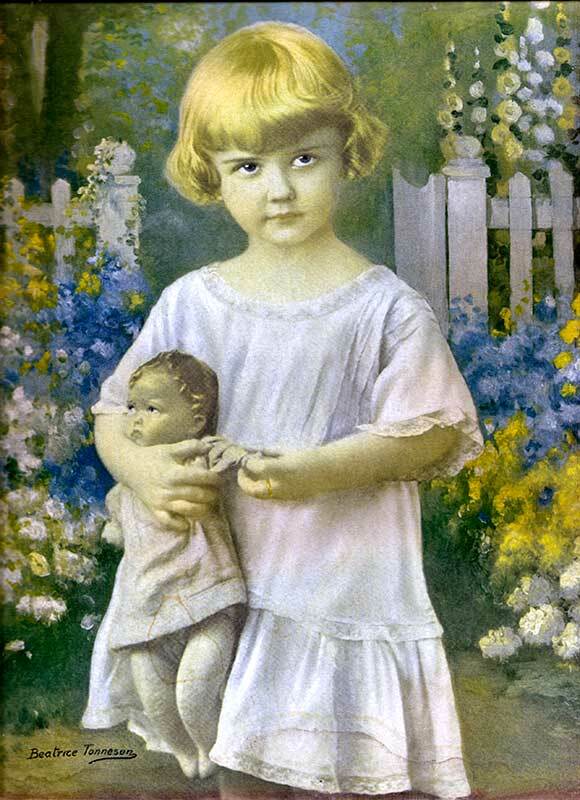 Meanwhile, the flowery background is reminiscent of other Fox prints, notably DeForest’s “Age of Innocence” [included in the Beatrice Tonnesen Catalog Album 7] in which Tonnesen model Virginia Waller (1913-2006) holds yet another vintage doll. 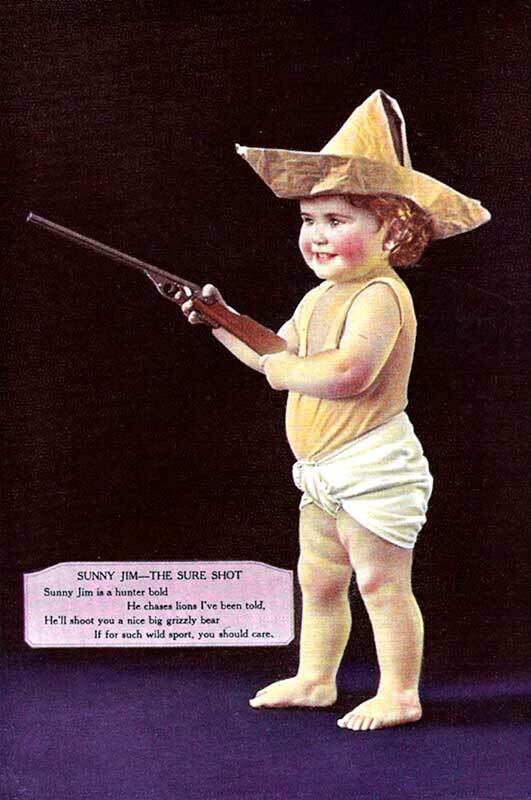 The second print, titled “Guard Duty” and found unsigned on a 1930 calendar, features another child model seen in photos from the Tonnesen archives in both the Oshkosh Public Museum and the Winneconne Historical Society, with inventory numbers that date them to the mid-1920s. The doll the child is holding appears to be the same one as in the signed Tonnesen print, convincing me that this image, too, is by Tonnesen. I had believed this to be Tonnesen’s work, based not only on the presence of the Tonnesen model, but on the photographer’s posing of the sleeping child on the makeshift prop, just as Tonnesen did in her photo titled “On Guard” (owned by Oshkosh Public Museum). 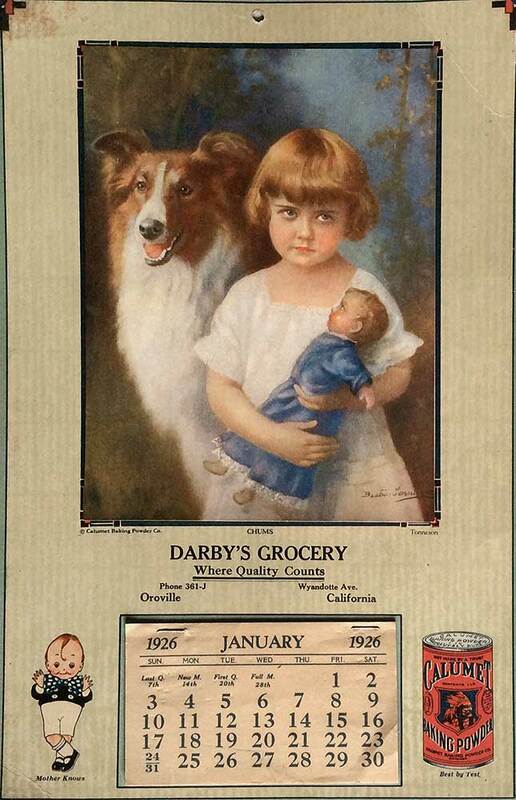 “On Guard” later became a painting by A. Pope, shown and titled “Safely Guarded” on a 1927 calendar print. In Pope’s work, the prop is painted over to become part of the landscape. This post and slideshow from October, 2010 contain both images. A site visitor, Helen Joy of Bournemouth, England recently contacted us about two prints, both copyright 1900, found behind the framed photo of one of her husband’s ancestors. I recognized one of the prints from her description, but the other was new to me. The prints are interesting for a couple of reasons. First, although Beatrice Tonnesen spoke about having an international clientele, these are the first that we know of that have surfaced overseas that don’t bear the name of a US publisher. Second, while I recognized one of the prints as the romantic image of a woman shown blowing bubbles, the other print, a whimsical image of a woman holding the leaf of a corn plant over her head, shown in this slideshow courtesy of Helen Joy, was new to me. Not only that, the woman in the corn seemed to be part of a series of agriculturally-themed images that were most likely taken at the same time. When I see a series of prints like this, I can almost imagine how Beatrice Tonnesen spent one of her workdays, posing one image after another, each appealing on its own, but illustrating a theme when seen altogether. 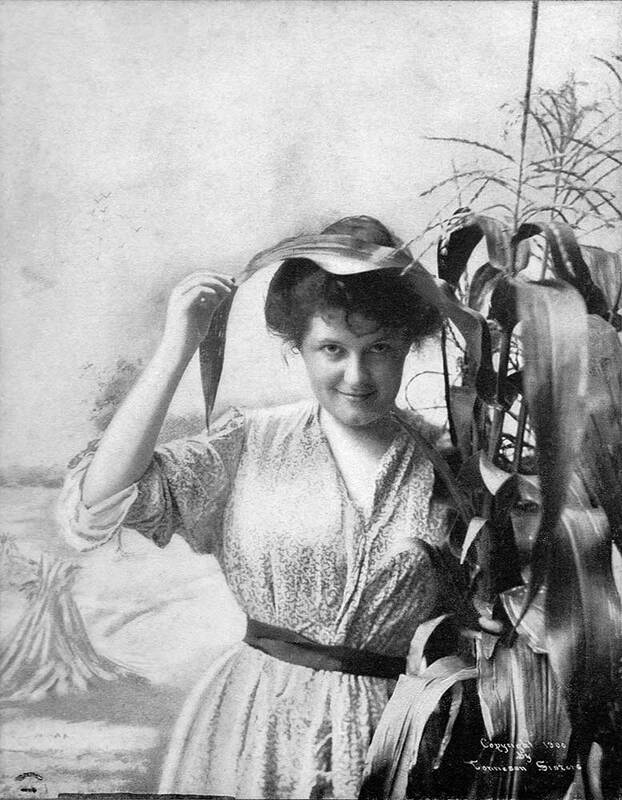 The images, in the order in which they appear in the slideshow are: Untitled image of a woman with a corn leaf, courtesy Helen Joy; and “Pigs in Clover”; “Country Gossip”; “A Hay Seed”; and the untitled image of a woman blowing bubbles, all by Tonnesen Sisters and all shown elsewhere on this website. Before the Tonnesen Sisters were known for their calendar prints, they were known for supplying photos of live models for advertising purposes. Early photographic and advertising journals featured examples of their work, touting everything from soap to farm machinery. I’ve also seen ads for various products that offered prints by Tonnesen, either free or for a nominal cost, as a reward for purchasing the product. I’ve always found those ads tantalizing, as they generally listed the prints by title without showing the actual print, leaving me to wonder what masterpiece I’ve missed! Finally, however, I have one of those illusive advertising premiums – “Finishing Touches,” a 1901 “art platograph” by Tonnesen Sisters, free to every purchaser of Johnson’s Baby Powder. I’ve scanned both front and back and posted it here. The print itself is notable in several respects. First, in all of my reading of vintage photographic journals, I have never seen anything labled an “art platograph.” Maybe there’s a photography buff out there who will know about it. 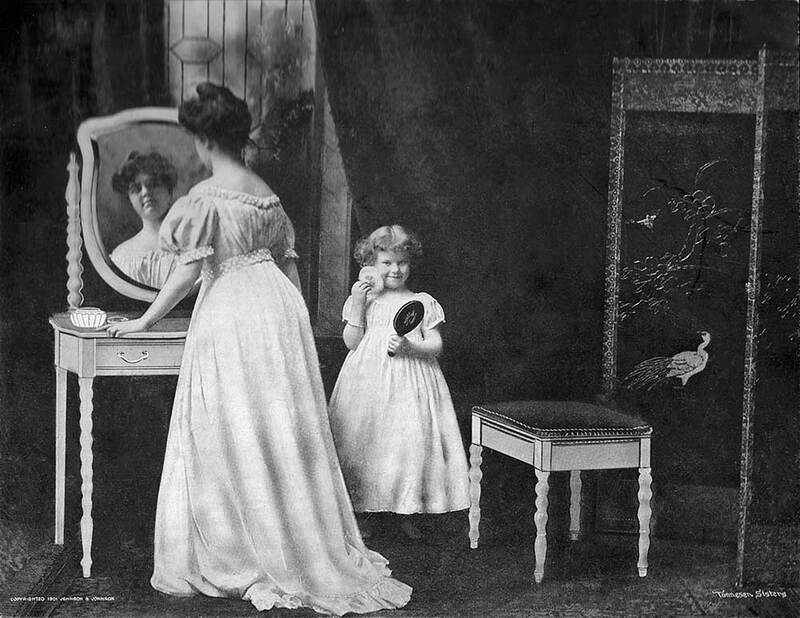 Also, I note that the vanity table and bench appear to be illustrated – not part of the original photograph. 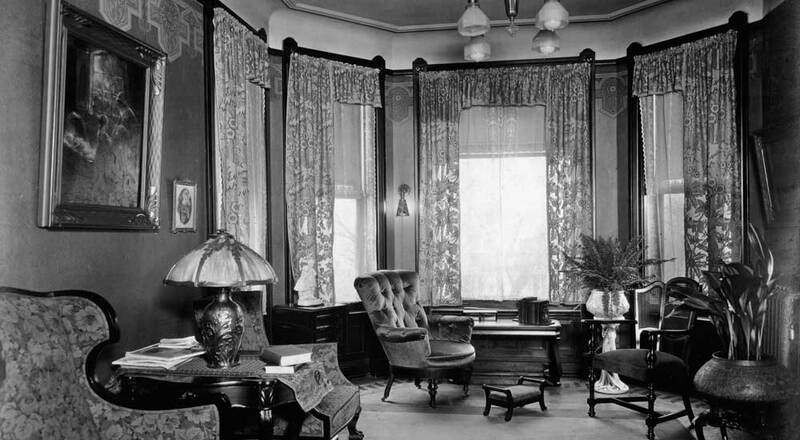 The leaded glass window was part of Tonnesen’s studio set, so it was in the original photo, but I don’t know about the screen. The child appeared often in Tonnesen’s work ca. 1900, and I believe she was a well-known Chicago child model named Edna Clifford.